what spin of mint for low tech windows user? I've got an associate who has finally come around to wanting Linux for his dad for just basic browsing and video streams. He's kinda low information, a carpenter. Which DE/Spin of Mint would you suggest for him? Why? I'm not sure Cinnamon is the best one, not sure about KDE either. I want long-term support. Re: what spin of mint for low tech windows user? Cinnamon would be fine, but perhaps Mate and Xfce are even simpler to use. In my experience, low-tech users are usually the easiest folks to support, because they don't tinker and tweak. Having been with Microsoft since the days of DOS, several versions of that 1.0 thru 3.0 thru 6.x and then Windows 3.0 appeared.... all the way thru Win7 and Win8.x....... then they brought out Win10 and I jumped ship. I am now using only Cinnamon 18.3 and with Virtualbox installed ( direct from Oracle ) I can now dabble in all of the other versions of Linux, from any distro to see how they feel. Mate was easier for me as an (mostly) ex-Windows user. I use Mint Cinnamon. It's the flagship Desktop Environment for a reason. All of the DE's are configurable but no matter which one I've tried (Mate, Xfce, KDE) I always find myself back at Cinnamon. I guess it's just comfortable. It is somewhat similar to Windows but once you configure it to your liking, any similarity to Windows really doesn't matter. 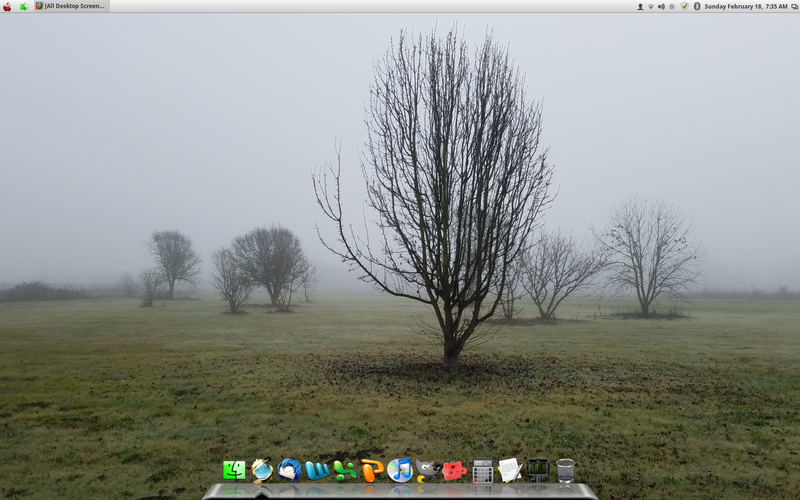 Here's a screen shot of my Cinnamon 18.2 desktop. I use the Alu theme with Cairo Dock and Mac4Lin. I like either Cinnamon or XFCE. I have a fairly powerful desktop computer, and I run Cinnamon on that. I also have an older laptop that I run XFCE on. There are a few things that I like about Cinnamon that I was unable to duplicate in MATE, but I was able to duplicate them in XFCE. I am going to be putting a new hard drive in my desktop soon, and will probably switch over to XFCE at that time. I like the idea of using all my memory and CPU for applications, rather than burning it up in the OS and desktop. XFCE is very frugal. So true. A litttle knowledge is a dangerous thing. Particularly with computers. This is exactly what I have done as well for my wife, sister and a l"low-tech" good friend. For my wife I did have to explain how to manage the file extensions for Libre Office vs MS Office and was surprised how well my sister dove into GnuCash to replace Quicken. My friend and his wife essentially just need a OS to run Chrome, their browser of choice, so they were easy. I also do all of Pjtor's tweaks from his website plus a few of my own and set up firejail and change the DNS away from the ISP ( I have recently been using quad9 although I like OpenDNS as well). I relabel the menu to START and put a few shortcuts that they are familiar with on the desktop as well. I try to make sure they know and understand why I am making changes but in every case I can tell they are not really interested as their eyes glaze over and it it obvious they don't really care and just want a system that works an is easy to use. For all of my friends who I turned on to linux Mint, they are all Windows OS refugees. They all got fed up with Windows 10. They all now use 64 bit Mint with the Xfce desktop environment and they all are quite happy. No Mint or Linux version will be that much like Windows ... even if you got it to look like Windows it doesn't work like it ... but I think Mate is a good choice here. Mate or Xfce, especially if the hardware is older. KDE is nice and bleeding edge (and not always in a good way). LM is not focusing on KDE any longer after 18.3. KDE is way different than the others because it's foundation is QT C, where Mate, Xfce, and Cinnamon foundation is GTK. Last edited by lmuserx4849 on Tue Feb 27, 2018 1:58 am, edited 1 time in total. Well, it seems that it's a toss up to some extent so I just installed Cinnammon since I'm using it also so I can support over the phone and also I couldn't get a VB 5.1 of Mate working that accepted guest add. so I couldn't check it out. If he complains about Cin, I'll do something simpler. It's a recent gen i3 with a 1TB drive, though only 4 GB RAM, I'm pushing for them to add a stick, but first things first. That's a fine reason. I don't think any of the desktop environments is inherently more 'complicated' than the others; once your associate can open the applications he needs from icons on the desktop, or from the menu, and they work the way he expects them to, he will probably be fine most of the time. And for those other moments there's the phone.